Apples were about to rot at home so while searching for Apple recipes to use them up faster before it is too late, I found this quick easy and simple recipe for Apple Kheer / Apple Pudding (you can also call it Apple Rabdi if you make it thicker!). Should serve about 4 persons. 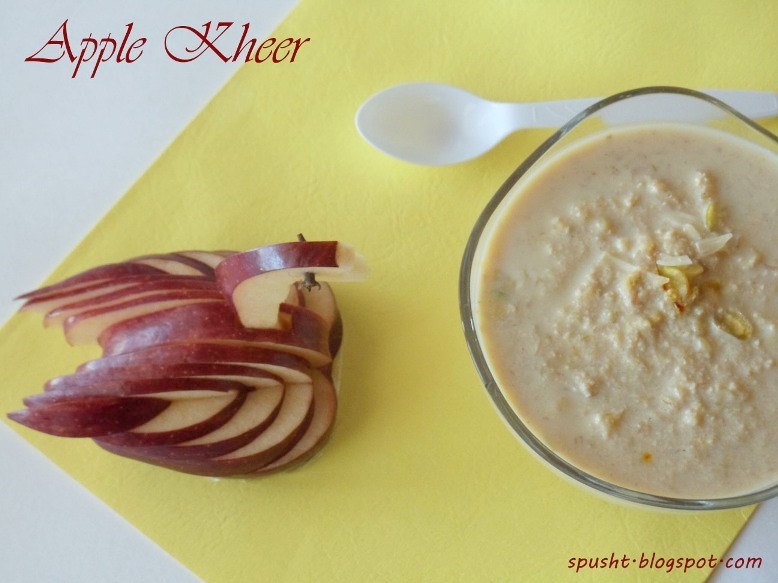 Apple Pudding - who would believe this kheer is made using apples?! Try it. Bring milk to a boil in a thick bottom pan & simmer till it thickens [5 cups should reducing to about 3-3½ cups is good enough]. Meanwhile thickly grate the apples without peeling them. Heat another pan & add the grated apples, cook on medium heat. Keep pressing & stirring them so that apple leaves it water & sourness; about 10-15 minutes. Add ½ cup sugar & stew (simmer/slow boil) till sugar melts & continue to cook till most of the moisture evaporates. Keep stirring or apple/sugar will stick to pan & get brownish. Then add some of the hot reduced milk to this pan. Keep stirring. The milk added to the pan of grated apples will curdle and there is not much you can do to avoid it, so just keep stirring. And you do not need to throw away the kheer just because the milk curdled, it will still be fine, don't worry. Keep adding some milk gradually; keep stirring & cooking till the apple kheer thickens some more on medium heat. Add cardamom powder, almonds, pistachios, cashews & saffron, stir & cook the apple kheer (or apple rabdi, or apple pudding) until desired consistency. 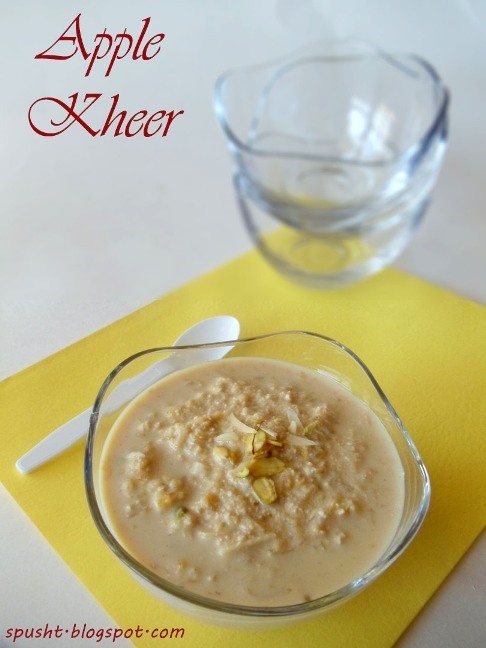 Switch off heat, let the kheer reach room temperature & serve chilled. * Gets quite sweet; adjust to your taste. - Saffron & all the dry fruits are optional – but they enhance any kheer! 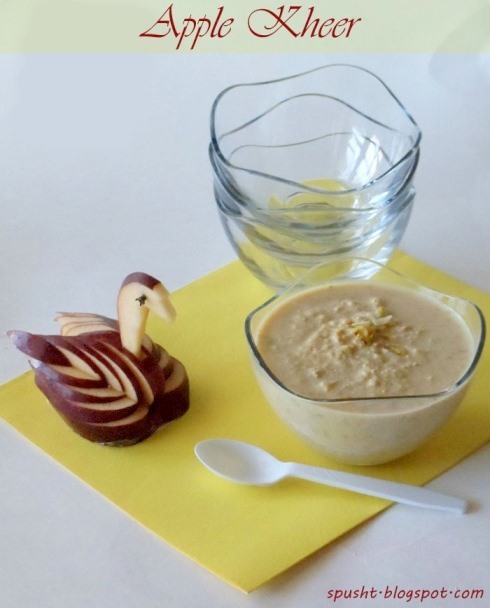 If you are serving this apple kheer to guests, make this pretty apple swan and place on the side for some compliments! This is Chef Neena's recipe! Hi I tried it and as soon as I added Apple, Milk became Paneer :(, I followed everything same. Overheard - Wives Discussing Husbands! Save Your Money - Use Coupons!